Thanks for stopping by – I wanted to add a page to this site to help you with the printables that I offer for free on this site and for sale in my shop – so it makes your printing much easier (hopefully!). Of course – all printers and computers vary, so these are general tips that should help. If you prefer, you can take your printable file to a local printer who will be able to print it off for you – or alternatively use an online printing service. I use the Canon PIXMA MG7750** (in white) – and love it. It’s fast and prints really nicely. Ideally you want a printer that offers duplex (double sided) printing, colour printing, and the ability to print on A4 and A5 paper when printing off printables. For printables I recommend a good quality paper, especially if you are printing items to frame, or to print on both sides (due to not being able to see each side through the paper). As such, a weight of 120gsm works really well. I use this one** mostly when I print anything and have had no issues with it. 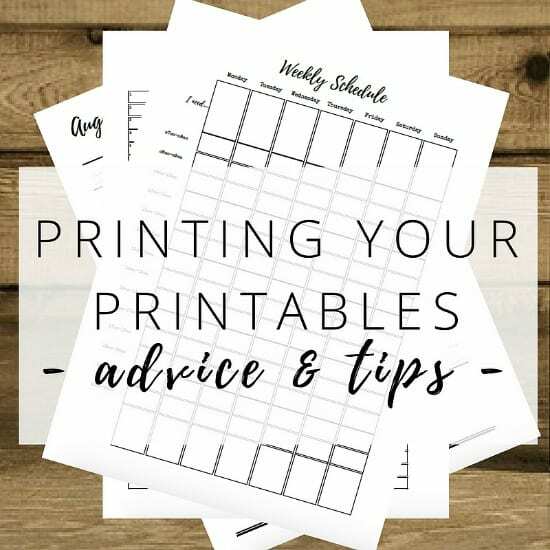 PLEASE NOTE – most of my printables are A4 / A5 / Letter or Half sizes and as such you can print directly onto that size paper with no need for trimming. However, there will be times when a smaller size is created that will print onto larger paper – and as such you will need to print these off and trim them to size yourself. When trimming, you will need a good quality pair of scissors, or a paper cutter**, and a ruler and pencil will come in handy to draw the lines you will trim to (I will always add in trim marks if the paper needs to be cut to size, so you will be able to easily follow the marks and cut to the right size). You will need to be able to look at the pdf printables (all my printables come as pdf files), and Adobe reader can be downloaded for free from HERE. Most printables are not editable – to protect them – but where editing is allowed, you will also need Adobe Reader to edit the places that you can change. #1 – Most purchases will download for you either into a pdf file or into a .zip file. pdf files are readable on computers and most e-readers just as they are, but .zip files need a little work before they can be read. .zip files are simply a way to group pdf’s together. This means that the files are zipped up in one file to make downloading easier. (To decompress (unzip) a file or folder on a Mac, double-click it. To open a zipped file using a PC, drag the .zip attachment to the desktop. Once the file is on the desktop, you can double- or right-click to open it. #2 – Always print “Actual Size” as all printables are created to the right size for you – there is no need to change this setting at all on your printer. #3 – Do a test print first to ensure your settings are all OK – this will save ink. By this I mean you can print as BLACK AND WHITE if you have any colour in the printable – this will save the coloured ink. #4 – If your printables are meant to be printed on both sides of the paper, most printers now allow for this. Just click on DOUBLE SIDED or DUPLEX in your printer settings. If in doubt, test a couple of pages first. Any double sided printables will have the margins correctly positioned to allow for hole punching – so if you print them out on single pages the margins will be slightly different on odd pages to even. If your printer does not do Duplux printing, then you will have to print the ODD pages first – then re-feed the paper into the printer and print the EVEN pages. PLEASE TEST THIS FIRST SO YOU KNOW WHICH WAY TO RE-FEED THE PAPER IN. #5 – Most printers won’t print right to the edge of the paper, so there will be a very small white edge to your printables. You can trim down if you prefer, but I always create printables that look great without trimming (unless trimming has been specified), to save you time! #6 – Colours may vary for printing than what you see on screen or on my pictures of the printables. This is due to the differences in computer screens and printers. Hopefully these have answered your queries on printing, but if you do have any other questions please contact me at info@organisemyhouse.com.